Stacy Sims, PhD, Author of ROAR: How to match your food and fitness to your female physiology for optimum performance, great health and a strong, lean body for life, joins Alyssa and Haley for an informative chat about how hormones relate to training and racing, birth control, menopause and everything in between. Plus, a listener question about female body image and positive role models. I listened to IronWomen podcast S3E12 w Stacy Sims this morning during my commute. The mailbag question about kits for younger girls entering the sport was a hot button for me, namely because of the story cited by Haley. This could be dependent upon my interpretation of that story but I feel like it’s a much deeper issue and the root wasn’t exactly addressed. The uproar seems to be coming from adults, not young girls, meaning that adults are seeing what school-aged girls are competing in and viewing that through a lens of sexuality, which is in no way the fault of the girls. That is a flaw within the adults and their interpretation of “showing skin” and their inability to separate sport and sexuality; again not fault of the girls, who I imagine are showing up with excitement to be able to compete wearing something reminiscent what their Olympic sheroes wear and compete to the best of their ability. It’s a shame that these discussions probably exacerbate how girls might not be delineating what they wear for sport, and the correlation of “skin” and sexuality. It’s a shame because this is NOT a discussion in men’s sport. Nobody’s saying that high school boys playing football in skin-tight britches or swimming at meets in tiny speedos is sexualizing them. 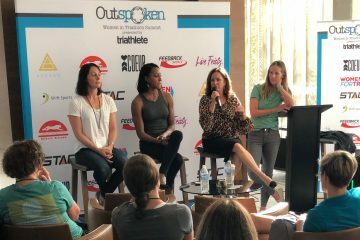 Further, young girls want look up to women at the highest level of the sport, and female Olympians compete in attire to optimize their performance. This is not because people want to see them in very little clothes, it’s to boost performance. Case in point, female Olympic swimmers, whose suits cover much more in recent years with the advent of the speed suit. IMO, this discussion is part of what’s pulling us backwards as a society, and reversing the progress that women fought so, so, so hard for us to push forward. I do agree with the ultimate advice for the man to impart upon his daughters: make sure they understand the array of options and point them towards what they feel comfortable in and what they feel allows them to perform their best, because that’s why we’re all here. PPS – Stacy Sims was a phenomenal guest, I wish I wasn’t driving so that I could have taken notes and will definitely give that another listen – I learned SO much!